To ensure that students are exposed to the latest thinking and developments in the discipline of management, FMS lays great stress on research and publishing. Faculty members are engaged in academic research and case development. They publish articles in reputed national and international refered journals. During the last 5 years FMS faculty have published more than 100 research articles in refereed journals. Most of the FMS faculty are the consulting editors for leading national and international research journals. 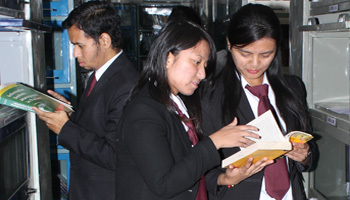 The Icfai University Press (IUP) has published over 1,500 books in Accounting, Banking, Insurance, E-Business, Economics, Information Technology, Law, Management, Finance, Marketing, Operations, HRM and similar areas. These executive reference books deal with contemporary developments in the business environment and their impact on managerial decision-making. IUP has a portfolio of 18 professional magazines in the areas of Finance, Economics, Banking, Insurance, Law, Management and Science & Technology. These magazines contain in-depth articles on domain-specific and interdisciplinary topics, debates, interviews, case studies and book summaries. IUP also has a portfolio of 48 research journals. The research journals contain cutting edge research papers in various domain areas namely: management research, corporate governance, marketing management, organizational behavior, operations management, systems management, infrastructure, knowledge management, services marketing, business strategy, supply chain management, mergers & acquisitions, entrepreneurship development, brand management and many more allied areas. The ICFAI University, Dehradun, Uttarakhand (hereinafter referred to as the University) was established under the ICFAI University Act 2003 (Act No.16 of 2003) passed by the Uttaranchal Legislative Assembly and assented to by the Governor on July 08,2003. The ICFAI University, Dehradun, Uttarakhand is sponsored by the Institute of Chartered Financial Analysts of India (Icfai), a non-profit educational society established in 1984. © 2016 ICFAI University Dehradun. All Rights Reserved.